The holidays are right around the corner and the shipping lines are getting longer and longer by the day, and yet many of us are still scrambling trying to finish our to-buy lists or may be even struggling to finish writing it. What does dad want? What does grandma need? What can we buy our co-worker? We can spend hours going around and around pacing the store aisle asking these types of questions. There is another way to choose a perfect gift for the special people in your life this holiday season. 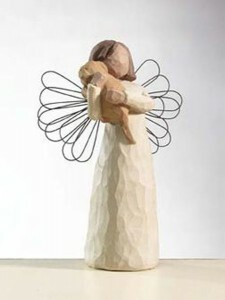 At Coppin’s Gifts one of our most popular collections is the Willow Tree Angel line of figurines. The problem many of us have when it comes to finding the right holiday gift is that we think about gifts in the term of being purely physical objects. If you can challenge this way of thinking and shift your focus it can be easier to figure out what to give the special people in your life. When you give a gift to someone, you are opening up and speaking to them. You buy a gift to give in the hopes that the receiver will love it and understand the message you are trying to communicate. We have lost sight of this basic concept over the years and put more value on the price tag and status of the gift rather than the message it conveys. The Willow Tree Angel line of figurines is a great way to get back to the way it should be! When you want a gift that means something and shows just how much you care and what you think of someone, head over to Coppin’s Gifts and check out the selection of Willow Tree Angel figures. You will be glad you did! A great deal of research has been done over the years that looks into why we as humans get the feeling of well-being that occurs during the practice of giving gifts to friends and family. From the earliest records of mankind’s existence there is the practice of gift giving and it has always been portrayed as being a rewarding experience that benefits the giver and the receiver. At the most basic level, the act of gift giving can make a person feel happier overall, helps them feel better about themselves, and makes them feel closer to the person receiving the gift. 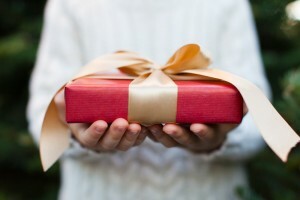 In studies done on the act of giving gifts, the giver often feels better about themselves and the receiver has an increased feeling of connection to the one giving the gift. The mutually beneficial effect is what makes gift giving such a wonderful and enjoyably experience. Research has also suggested time and time again that giving gifts can help improve the focus as well as a person’s overall state of mind. If giving a gift makes someone feel happier and gives them a sense of purpose then that will of course give a boost to their attitude and emotions and help them have a more positive outlook on life. Gift giving helps establish societal bonds and mutual gift exchange allows the bonds of community, friendship, and family to be grown and nurtured. Not only does the person who gets the gift feel closer to the giver, but the reverse happens as well. This greater social connection allows us to feel a sense of companionship and as well as the overall happiness of both parties involved. When someone begins the act of giving gifts, not only are they more likely to continue giving whenever they are presented with the opportunity, those around them including those that receive the gifts are more likely to pay it forward as well. This can be partly explained by the release of endorphins in the brain that occurs when we exchange gifts. It is easy to see that gift-giving is an important tradition and is part of what makes us human. So when you are looking for the perfect gift, whether it is a beautiful hand painted masterpiece, a special memento like a Jim Shore figurine, or an elegant diamond necklace, the important thing is to give with an open heart and a smile that is contagious.